When I was still in the early phases of this blog, I reviewed Purely Decadent’s coconut milk ice cream. It wasn’t my best review and I now also realize that I should have used my own picture – not the promotional one from the site (sigh). Anyways, this entry revisits ice cream made with coconut milk, but, this time, of the homemade variety. Although this coconut milk ice cream is not SCD legal due to the addition of chocolate, the coconut milk that I use is since it only has water, coconut, and citric acid. All the other ones have xanthum or guar gum, at minimum. There is a difference, I’ve found, with the consistencies of coconut milk based on if it does or doesn’t have xanthum or guar gum in it. 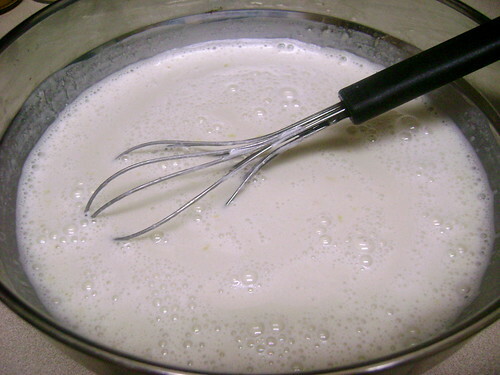 I once made the custard with coconut milk that had gum, and it was much thicker than it normally is when I’ve made it with the coconut milk without the gum. Plus, everyone who ate it, as rich as it normally is (again, with coconut milk without the gum), couldn’t finish the kind made with the coconut milk that had the gum. The first batch I made of this ice cream was a half recipe, and taking a leaf out of Purely Decadent’s book, I used agave syrup. The ice cream used to be made with cane sugar but now the label lists agave. It does make for a smoother consistency and flavour. Also, a tip about freezing: the first batch I froze overnight instead of the 2 hours suggested (it was late and around bedtime when I first made it). Next day, it was rock solid! 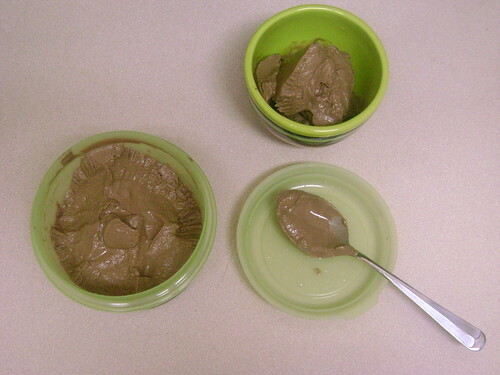 It took hours to thaw in the fridge, and when it was completely thawed it reverted to pudding. So, unless your freezer’s temperature is controlled or something, please try to freeze it at least for only 2 hours. Having said that, it must be my freezer or something because the sides always freeze first while the middle is still pudding/custard even after 2 hours, so it’s more like 2 1/2 to 3 hours in my case. The original recipe specifies two 13.5-ounce tins of coconut milk, but the size I had was 14 ounces, so that’s what I used. I don’t think it makes a big difference, however. Adapted from a Whole Foods recipe. 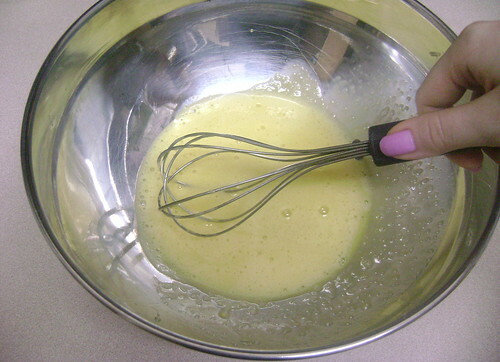 Beat egg yolks with a whisk until pale, 1 to 2 minutes. Mix in agave syrup and add coconut milk. 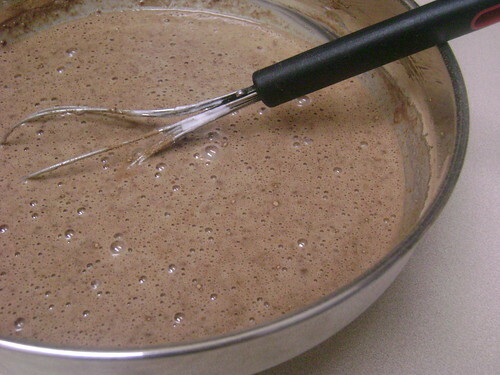 Add cocoa powder, whisking until all the ingredients are fully mixed. 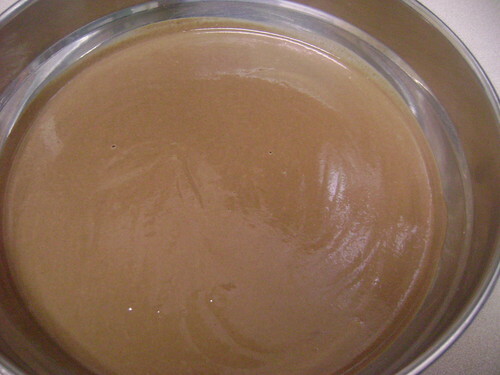 Transfer to a small or medium-sized pot and cook over medium heat, stirring constantly, until just thickened, 8 to 10 minutes. To test if done, it should coat the back of a spoon. 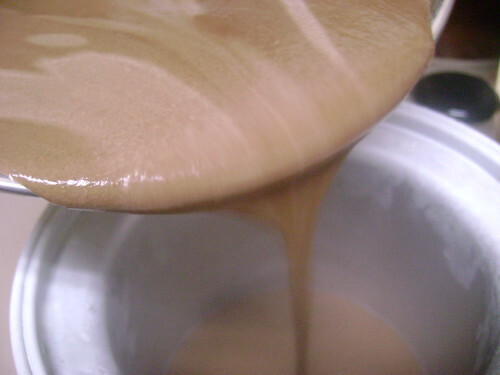 It will be near a pudding-like consistency and thickness. Pour into a bowl, cooling slightly and add vanilla extract, (at this point, also add any extra agave syrup to taste if necessary) before covering and chilling in the fridge or freezer until cold. 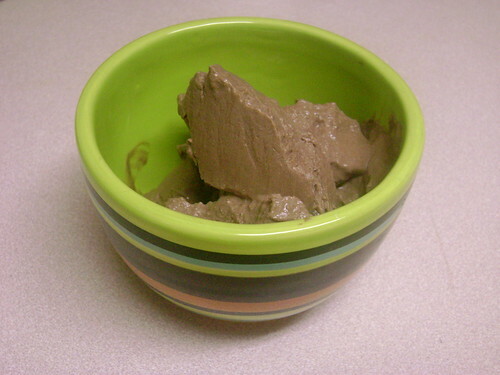 Process in an ice cream maker for about 10 or 15 minutes, or according to manufacturer’s instructions. Transfer into a container with a lid and freeze for 2 hours, or until firm. Serve and enjoy! I didn’t make a video for this recipe, although I think I should. What’s your opinion? Vote! Poll will close next Tuesday, March 13th, 2010. Poll closed! Thanks to everyone who participated! This entry is linked to Slightly Indulgent Tuesdays.